Melatonin to find the sleep. The pains of osteoarthritis must they be treated with glucosamine, or methyl sulfonyl methane (MSN). The depressive disorders will be reduced thanks to Griffonia simplicifolia. The stress will have to be fought by a magnesium cure, vitamin B, more various substances (natural) to suppress it more effectively. Tiredness will be decreased by extract of bark of pine, and by a complementation with Ribose, a glucid which would be too low in blood. It would also be advisable to take a immunomodulator to protect from the immunizing aggressions. And according to such or such person, the treatment would be different. A natural treatment of the fibromyalgia of this type is long and expensive, and according to the naturopathe consulted posology can be very variable. When one reads the comments of certain Net surfers on the forums dedicated to the pains of the fibromyalgic type, one is in right to think that does not concern all the patients reached of fibromyalgia, because many of them are not found in the problems of intoxication to heavy metals. One remain in a classical approach with force potions, beverages, associations multiple, etc I moreover received several times of the patients suffering from fibromyalgia, having made times up to 2 years of chelation of heavy metals without no convincing result (it is in particular the case in the video below). 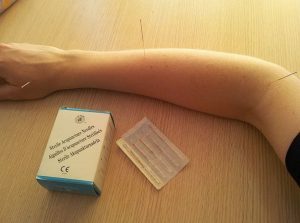 On various forums, one also finds testimonies of patients reporting their experiment with acupuncture. A study published in the medical Newspaper Journal of NeuroImag shows indeed that 8 meetings would reduce approximately 50% the felt chronic pains. In this case one will speak about provisional improvement, but not about treatment strictly speaking. The flowers of Bach© have an action even more random, it does not have there a complex of flowers defined for the natural treatment of the fibromyalgia, the naturopathe must adapt posology according to each person. The results can be encouraging, certain people feel better after the catch. To in no case the flowers of bach© cannot deeply treat the causes of a fibromyalgia. These 2 methods of care help the patients with better living, which is already well, but one cannot speak about cure. The cause of the fibromyalgia given nor is not treated. Homeopathy was part of a study on the syndrome fibromyalgic. One noted a reduction in the symptoms of tiredness, anxiety and pains. The exercises of relieving, like the sophrology, yoga, the mental meditation in various forms can contribute to decrease the stress, which often is part of the symptoms of the fibromyalgia. In the same register of a natural treatment of the fibromyalgia, we found hydrotherapy to slacken the muscles, to decrease the pains. Baths, spas, jets on the painful parts make a massing effect and improves quality of life. We cannot speak about fibromyalgia and natural treatment for these methods, they are improvements, a better comfort of life there still. Techniques associating of the low frequency sounds, which would stimulate the recall of events successor in title of the neurologic disorders are also developed by researchers. A second phase, a psychotherapy to give again a new direction with these events supplements the treatment. Lastly, a third phase of integration allows a resumption of the normal life. This technique is very expensive (3800€ to 4500€), it must mobilize the patient approximately 20 days consecutive, it was not yet the object of studies pushed on the fibromyalgia. The sport and the physical exercise in general are certainly the most invaluable assistances to fight the fibromyalgia. Many testimonies attest improvement or of remission thanks to a physical-activity of average intensity. The watery activities are often easiest to practise. To make a little sport moreover will go up the moral one, the organization releases from the alleviating and releasing endorphins which counterbalance the usual pains. In all the cases, as long as that is possible, for all the invalidating affections, the practice of physical-activities is always beneficial, even more if it is practised in the open air. It is the method of natural treatment of the fibromyalgia which I initiated and set up for all the patients from which the fibromyalgia comes from an electromagnetic interference. This track was never deepened by traditional medicine. However which among us does not have a leading, a dental prosthesis? This theory rests on the principle of the antenna effect and the electromagnetic fields. By subtly radiating – with low dose for the scientists, but sufficiently to cause disorders – accused materials the fields disturb electromagnetic naturalness of the human body. These disturbances which always do not feel, often insidious, degrade slowly the muscular reactions, the quality of the sleep, increase the level of stress, etc… For little that the person sleeps or works near to a Wifi terminal, and the effects will be multiplied by ten by it. According to the sensitivity of the patient, and its degree of pollution, the health problems in cascade appear. The remission rapids, even spectacular are frequent, in general all the patients see their daily newspaper improving, their life to become again livable. A natural treatment for the fibromyalgia will be generally leaned with an adapted food, excluding the gluten and the dairy products, according to the principle of Dr. Seignalet. The food is like often an element of cure essential, dominating, which one should not neglect even after having been deparasity. This review of the various natural approaches to look after the fibromyalgia appear random to me, the effects are very often transitory, one more often observes of the relieves than cures. All this encourages me to continue in the way which I opened up: déparasitage in mouth of the matters incompatible with the subject. The electromagnetic dimension is absolutely not taken on in account, and as I say it in the page which treats fibromyalgia there is quantity of diseases which present very close symptoms and which are really different. The cause of much of fibromyalgia is an electromagnetic interference due to matters in mouth or on the body. All the patients fibromyalgic that I could test are proven électrosensibles and intolerant with certain materials in mouth. In conclusion of this analysis of the various approaches I will say: Fibromyalgia and natural treatment, yes, but not anything, not at any price. Make beforehand test your matters stops some (or on the body) in order to determine if you are incompatible before you to launch in therapy long and ruinous for dubious results. This video was carried out with the agreement of a patient who suffered from a fibromyalgia. I received it with my cabinet, it had very tried or almost during 2 years. He remembers very well that all its problems appeared during the replacement of amalgams by prostheses (out of Zirconia in its case), until in becoming completely blocked. The postural tests that I made on him showed immediately of the incompatibilities with dental prostheses. At the time of its visit after extraction and replacement of the incompatible matters, he even declares himself cured to him! Yes there exists a natural treatment of the fibromyalgia! Read testimonies of patients suffering from this disease received since from the years !